Tribes Overall: "Yes - and more. Excellent food. Friendly people. Superb wildlife"
Tribes Service: "Tracy was very helpful with adapting our itinerary for our needs, and ensuring that the booking process ran smoothly throughout. My only slight quibble would be that I would have liked the detailed itinerary, including pick up times, times of walks, etc, before we arrived, but that's very minor as Swiss Travel provided all the necessary info on arrival and everything ran smoothly." Guides: "All our guides were very knowledgeable, friendly and very good at engaging the children as well as the adults. They were also accomplished at phone-scoping. I would recommend all guides, who were among the best I have used." Social & Environmental Responsibility: "We used a variety of local guides, and the local transport network (shuttle buses, etc) are very efficient. We also ate local food as much as possible. Recycling facilities are very widely available, and no foreign objects (including toilet paper) are allowed to put down the toilet, which is a very positive measure." The rustic feel to the lodges, with mosquito netting instead of glass for windows, really made us feel like we were part of the rainforest - especially listening to the night-time sounds, and the frog visiting our shower! Very nicely presented, with towels folded into swans on arrival. Beautiful gardens, full of amazing wildlife, including monkeys, toucans and blue land crabs. The access by boat was part of the adventure, and the fully inclusive programme of activities was well organised and perfectly paced. City centre location meant we could at least get a sense of this bustling city at night, even if our schedule didn't give us time to explore fully. Comfortable. Friendly. The breakfast display was possibly the best of the holiday and certainly gave us a good introduction to Costa Rican food. Wow. What can we say? This was a much busier hotel, but didn't really feel like it. The individual lodges were spacious and comfortable - and the towel animals were brilliant. Incredible views of the volcano. Gorgeous hot spring pools - you can even eat at the sushi bar without leaving the pool. The welcome team were very attentive, and even took our bags by golf buggy. They changed our room so that were next to a family who we had met earlier in the holiday. This attention to details and customer care was maintained throughout the holiday. We are not used to this sort of luxury, which was rather a contrast to Tortuguero's rustic charm. Incredible views over the rainforest to the Pacific Ocean - complete with frigatebirds, boobies and pelicans. The white-faced capuchins were easy to see, while we were even treated to visiting squirrel monkeys at breakfast. Excellent birdwatching from balcony, and especially from restaurant. Several of the waiters were good birdwatchers and keen to share their knowledge and enthusiasm with us. Enormous beds - complete with the view. Huge bathroom. Delicious food. The large gift shop and adjacent butterfly garden (complimentary entry included) were an added bonus. 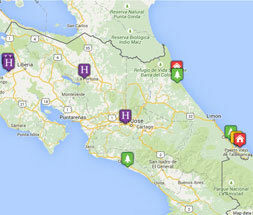 The perfect location for access to the Monteverde Cloud Forest. Only a ten minute walk from the entrance - and its amazing hummingbird gallery. Huge room with its own garden room enclosed balcony. Very helpful staff when we decided to book additional activities. Multi-tiered gardens full of wildlife and with excellent views. "We visited Costa Rica with the hope of seeing sloths, red-eyed treefrogs, monkeys, macaws, hummingbirds and possibly even a quetzal - and we saw all of these plus much more. The pace of the holiday was perfect for a wildlife-loving family with regular guided activities mixed with sufficient free time to relax or explore on our own, allowing us to see more than 220 species of birds, 19 mammals and about 20 reptiles and amphibians, plus many insects and flowers. From exploring Tortuguero by boat to swimming in the Pacific, seeing the impressive Arenal Volcano at its best and visiting the world famous cloud forest of Monteverde, this was really a holiday of variety and unique experiences - for the adults as well as our nine year old."